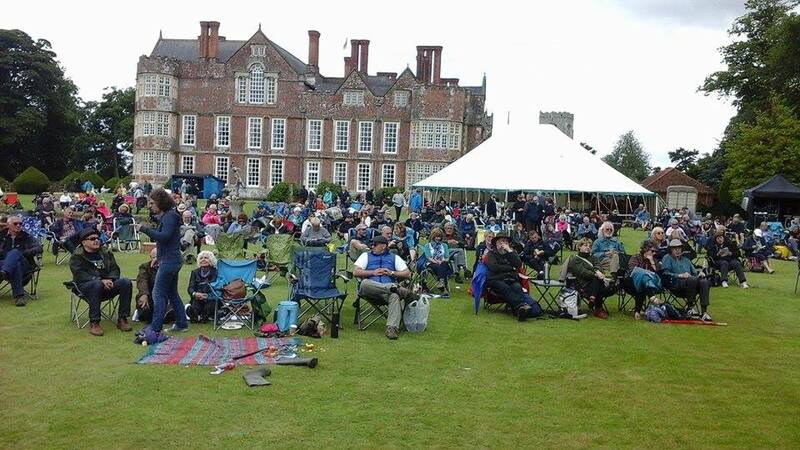 bebop spoken here: Burton Agnes Jazz and Blues Festival 1/2/3 July 2016. 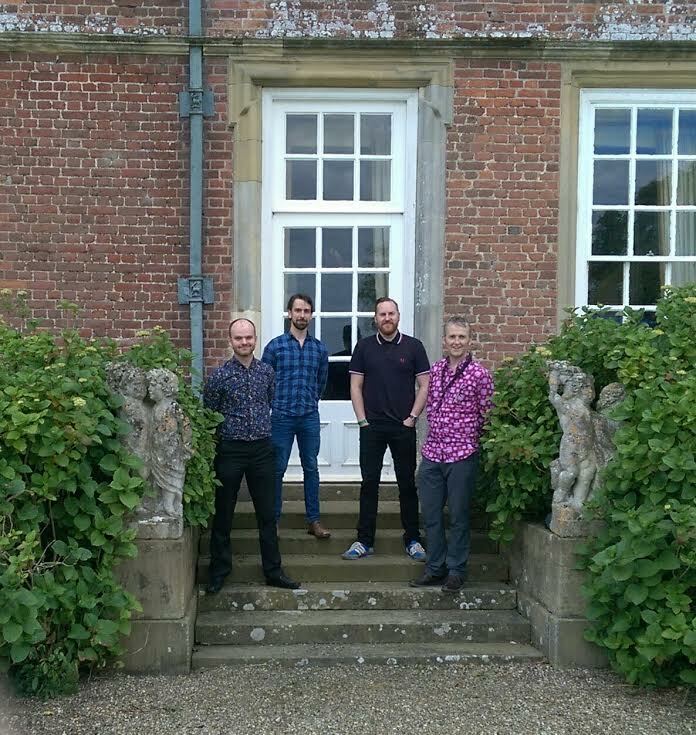 Burton Agnes Jazz and Blues Festival 1/2/3 July 2016. The location for the festival is spectacular with sumptuous gardens, woods, an impressive gatehouse, lovely church and an incredible stately home with a large collection of art. It’s not at all overcrowded with plenty of room to move around and no long queues at the bar or toilets, and while food and drink is expensive, it’s not extortionate. The weather is a major factor and you would hope that the beginning of July would give you the best chance in this country though, talking to regulars, it appears they’ve had real nightmares in the past, so we were probably lucky with a cold, damp Friday and sun and showers alternating through Saturday and Sunday with the ratio improving through Sunday which turned out very pleasant. It’s ideal for anyone with all the gear but who doesn’t care to brave the horrors of Glastonbury and the like. There’s a spread of music, most, but not all, with a Jazz connection, though sometimes tenuous, and a couple of acts to tempt the hard-core Jazzer. It also claims to play blues although there was really nothing to justify the claim, a slight bugbear to some. A hectic week and chaos on the roads meant we arrived bang on time. The first band were just starting as we walked the ramp; decked in tux, a singing trumpeter, sax and guitar trio playing Night and Day and Sunny Side of the Street, some lovely local beer to warm me up, or at least help me forget I was cold and a chance to explore, with kids dancing and playing in front of the stage, grownups joining in as they walked past. You could hear the music all over the site, the crooning snaking through the often thin line between straight and novelty; Blue Bossa as the rain came down, Singing in the Rain appropriately, Summertime - what else? The sun came out in time for When You’re Smiling followed by Fly me to the Moon, I’ve Got you Under my Skin, As Time Goes By, Bye Bye Blackbird and It Don’t Mean a Thing. It was played well, terribly nice, laid-back, old-time and pleasant and the reader must make up their own minds whether this is a good or a bad thing. At some point I realised the band weren’t as advertised and I made a mental note to find out later who they were. 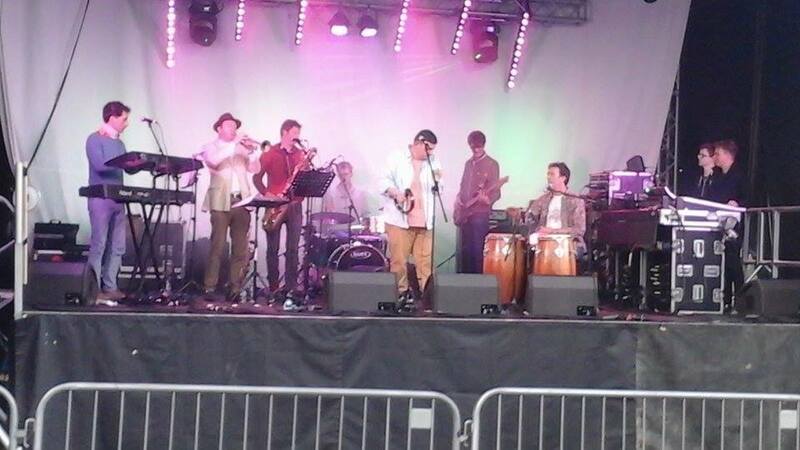 The other band on the main stage on Friday night were Bugalo Foundation, a nine piece led by conga player Sam Bell. With no Latinos in the band they play an authentic Latin sound, illustrating that music at least knows no cultural and ethnic boundaries. I’ve never quite got why so many people from my background are so preoccupied with Latin music – any Latin music – but I love the way congas, like tablas, cut through. Some Santanaesque stuff sans guitar and a version of Bob Marleys’ Get Up Stand Up and he thanked the organiser for a fantastic festival. Not yet, but tomorrow’s another day. The main stage finishes at ten but anybody wanting more piles into the bar tent. Friday night kicked off with singer/ guitarist/ songwriter Jess Gardham, with loads of charisma and a big grin, sounding like Joan Armatrading or Tracey Chapman with a hint of Cranberries or Dido, which sold her loads of CDs. She was followed by the Whiskey Dogs, a family affair doing Americana but without taking themselves too seriously. I remembered I still didn’t know the name of the first band but decided to leave it ‘til the next day. Manjula opened Saturday with a real blend of African, Latin and Mediterranean (apparently Portuguese) influences led by former Leeds student Vanessa Rani with a lovely and powerful voice following Indian vocal training, and a band featuring her music teacher Sam Bell on congas and other Leeds alumni, including Simon Reed on bass. The sun had yet to come up but the music was definitely looking up. Manjula are due in Newcastle on the 12th of this month and there’s an album forthcoming – yes please. I’d already decided to give Pan Jumby a miss; I’ve seen them before and not sure about steel pans. And there was a Duke Ellington homage in the hall at the same time, featuring a BBC reporter, a BBC cameraman, a local brewer and festival organiser Simon Cunliffe Lister, singing, playing two guitars and alto respectively. Don’t mean a Thing got things going followed by In a Sentimental Mood which had the festival organiser switching to piano – very impressive - behind Kate Sweetings’ stunning vocals. Take the A Train , Caravan – the highlight – and Solitude, with Sweeting putting a slightly different spin on the familiar melody and Lister, starting off low on the instruments register, had me wondering whether Ben Webster was the original saxophonist, and thinking he attained some of the soulfulness of Webster; and using space like a seasoned pro. Don’t get Around Much Anymore to close, sung by Sweeting, now accompanied by her three month old baby to woo the appreciative audience and reminding us how family friendly the whole thing is. 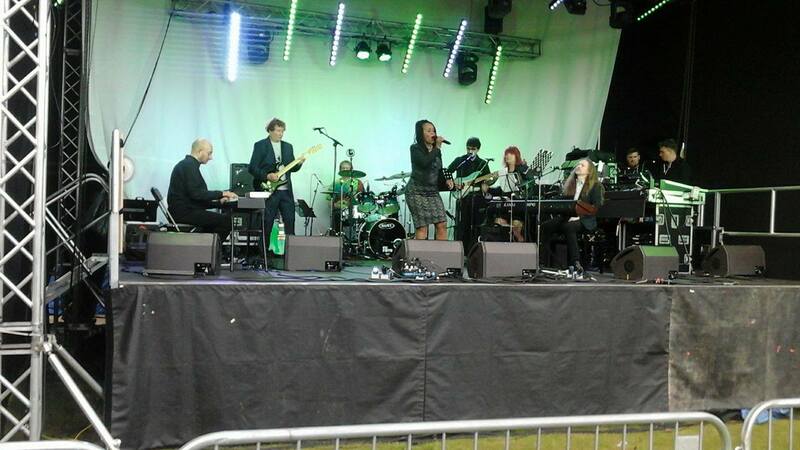 hat Jazz Festival fringe events are all about and was undoubtedly one of the highlights. 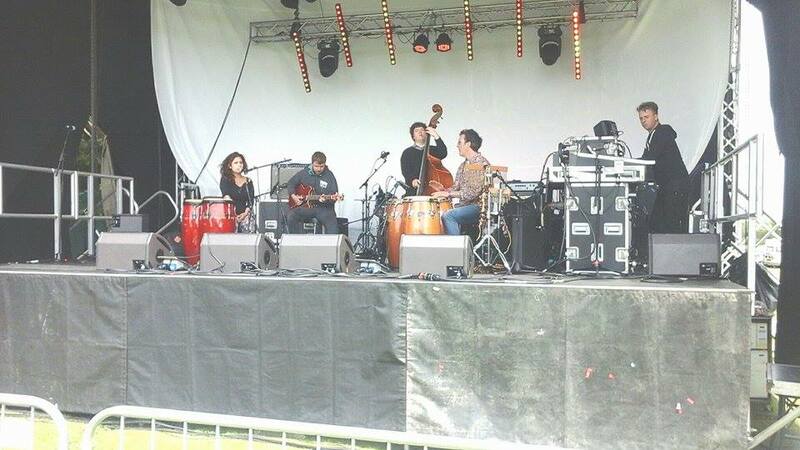 Back to the main stage in time for the Blind Monk Trio, probably the festival band I most wanted to see. For the first time, no Latin or African influences, no Great American Songbook or contemporary pop songs. A bit of hard-bop and a lot of freedom, stripped down to just sax, bass and drums; no piano but lots of Monkisms, BMT are part of a New Wave of British Hard Jazz, each in their own way extending the music into different areas. Early evening and the Elaine Delmar set was split between the Gershwins and Cole Porter, who she described as the two greatest composers of the C20th, though I think the two greatest writers of popular songs may be easier to argue. Not someone I’m familiar with, she strikes me as coming from the Cleo Laine school of Jazz vocalists and if it’s your thing , you’d have loved it, and if not, you’d probably still like it anyway. The Gershwin section inevitably climaxed with excerpts from Porgy and Bess including I Love you Porky, Ain’t Necessarily So – criminally overshadowed by Summertime - and, after a great reference of My Favourite Things during Summertime, we were off into I’ve got you under my skin and Night and Day, but gradually slipping through that thin line into easy-listening. The band were exemplory, particularly Bruce Adams playing mostly muted trumpet and the reference to Ain’t Necessarily So during Porter was a masterstroke. I estimated a crowd of a little over two hundred on the field, swelled to over three hundred on Saturday, presumably for festival headliner PP Arnold, an Ikette who was persuaded to stay in the UK by Mick Jagger. Not surprisingly, we got River Deep Mountain High, her Northern Soul classic, God only Knows, Eleanor Rigby by one group she loves and To Love Somebody by another. Stevie Wonders’ Uptight was the best thing she did and got the best response and, for the only time during the festival, people tentatively expanding into the space immediately in front of the stage. She’s charismatic, her skills honed over many years of touring the UK, pouring herself a nice cup of tea from a flask during the set. Inevitably First Cut is the Deepest brought things to a rousing closure. About a hundred crammed into the bar tent, most for The Alligators, but in the meantime were served up Barnsley humour and original folky type stuff by singer/ guitarist Nick Rooke, helped out on fiddle and flute by Paul Blackburn. Apparently Nick had hurt his finger and a running joke was that Django Reinhardt did more with one finger than he can manage with four, which was as much to do with Jazz as this enjoyable set got. Alligators finished the night; a blues-rock band playing the festival for the fourth consecutive year. I’ve seen dozens of these bands and they’re terrific fun live. 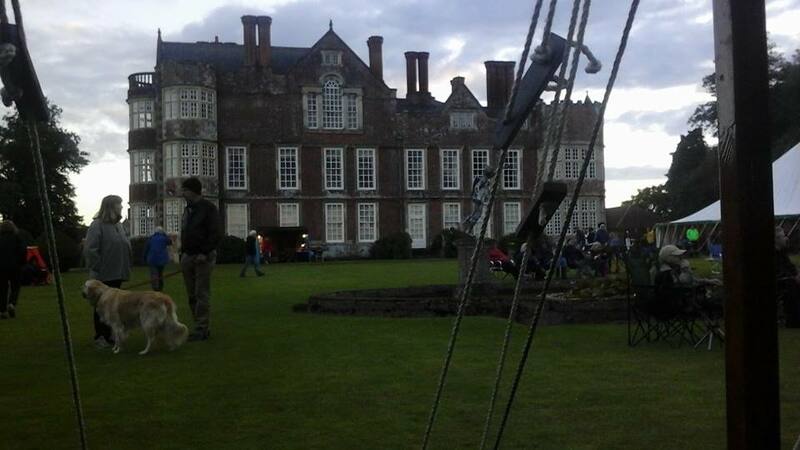 They entertained the bar and campsite, and presumably the surrounding area until the early hours. Violinist Matt Holborn provided the festival with its Gypsy Jazz, with Mick Shoulder milling around. We’re spoilt for Gypsy Jazz in the North East with probably more bands than anywhere outside Paris, and once you’ve heard Emma Fisks’ coda to Nuages, nothing else matters. I’d decided to skate over Lindsay Hannon and Graeme Wilson as the North East is well familiar with them. With Mick depping for John Pope on bass, James Harrison on piano and Russ Morgan on kit, Lindsay sings the blues, she knows what she’s doing and did it well for an appreciative crowd. One shortfall of the festival is the absence of any meaningful jam session. Sunday afternoon was hosted by Duke Ellington Homage guitarist Michael Nagasaka in the courtyard area, surrounded by shops and cafes, and soon became a guitar duo. A blues kept going round with some serious improvising from the newcomer interspersed with verses of Route 66 by the host. Georgia on my Mind was abandoned in favour of I got Rhythm, Summertime and Blue Bossa which found them getting it together. In the middle of it all saxophonist Tom Drew arrived, an in-between student (sadly not in music) from Goole who provided an excellent foil, fitting in brilliantly despite having hardly any musical training and little familiarity with the material. The host had told me that, before Jazz, he played Hendrix and Led Zeppelin so I suggested Purple Haze but he went into Voodoo Chile, Tom doing a dream job slipping in some welcome sax and the growing number of onlookers loved it. 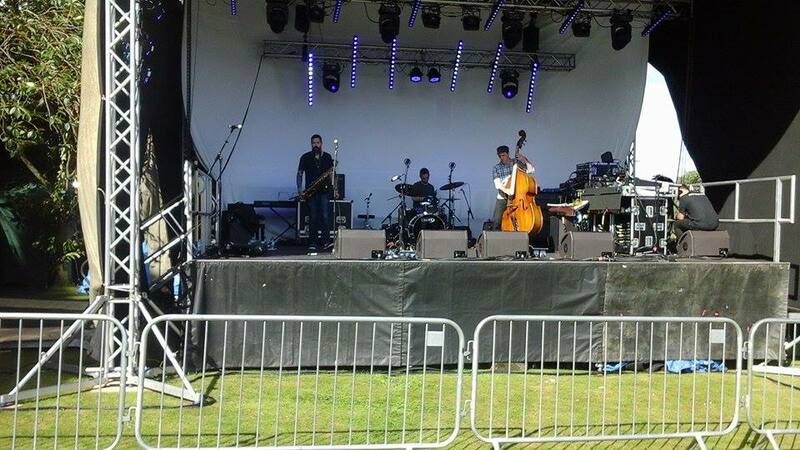 Graeme Wilson on sax, Andy Champion on bass, Lord Paul on keys and drummer Adam Sinclair were in full swing when we got back to the field. It’s oft said that the North East punches above its weight in terms of musicians and singers and, as a reviewer, you sometimes wonder whether you are caught up in it all. However, this quartet is very much in the vanguard of the New Wave of British Hard Jazz, comparable with the very best and a minority of the crowd agreed with me that this was the highlight of the festival. Graeme said afterwards how fortunate he is to play with this calibre of musicians and he’s right, but they are also fortunate to play his compositions with him. And Lord Paul switching to Hammond(ish) was just the icing on the cake. I’d always planned to pack up listening to the final band of the festival, Ben Beattie’s After Midnight Band, having heard bits of their earlier set in the Hall. Perfectly pleasant, their playing was excellent, particularly the leader, and I’m sure the audience will have loved it, but a tad smooth for my tastes though, had we been able to contact him, I’m sure Russell G could have made his way down in a heartbeat. Conscious I still didn’t know the name of the opening band on Friday I decided to let it go on the basis that most of the people there probably couldn’t name any of the bands they’d seen, which was all part of this festival, and no bad thing either. Would I come back? Depending on the line-up, yes, but I’d check the weather forecast first. 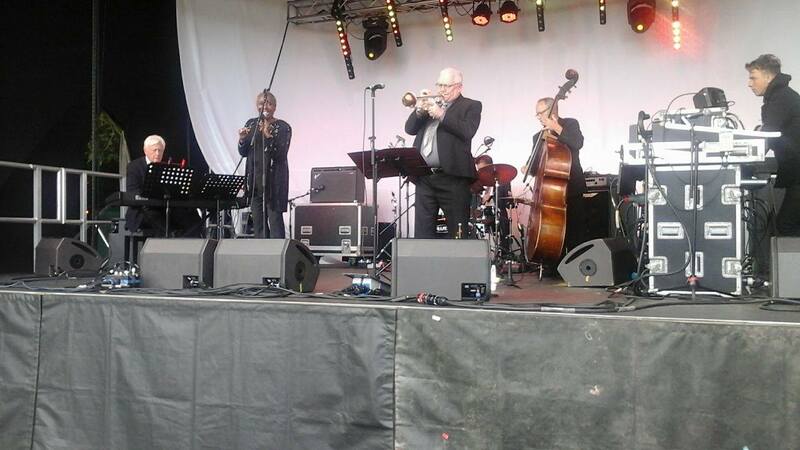 Was it worth missing the Steve Glendinning Quartet and John Popes’ Ornette Coleman homage for? Probably not. Did I enjoy it? Absolutely. Did my companion enjoy it? You’d have to ask him but I suspect he’d say no though I’m sure he enjoyed it far more than he realises. As someone who hopes to make a difference as a Jazz musician, it was a reality check; like Santana recognising that Woodstock couldn’t bring down ‘the greedy, square system’ or Corbynistas realising their £3 won’t bring down late capitalism. But the festival organiser, bouncing with charisma, with infectious enthusiasm, mixing with festival goers and seemingly everywhere all at once, has a great little festival chipping away at the established music hegemony.